The common opinion is that American tourists abroad are a bunch of insufferable ignorants. Supposedly they take their prosaic habits, funny packs, running shoes and a desire to find a McDonald in France and proceed to trample all over the world’s treasures. Well, that may be. But if you hope that European tourists behave better in US you are seriously mistaken. Visiting Utah deservedly famous Canyonlands and Arches National Parks we are being unwillingly subjected to an invasion of German, French and Russian touring groups. Compete with one another in a strangely seductive game of let’s confirm the worst national stereotypes. 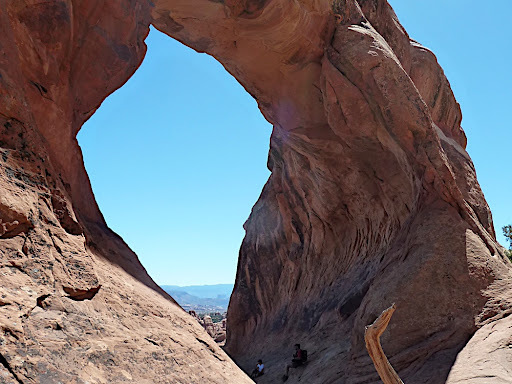 Russians run out of a bus, choose the wrong direction on a loop trail, gallop along the path and than pack the overview of one of the arches so densely it’s impossible to see anything. They could all just back off couple of meters to improve the situation but a photo shooting collective knows no reason. Seconds before they appear I am asked to take a picture of an Asian kid who travels alone. He tries to pose and he’s nearly pushed into an abyss by an arriving flock. Seeing how he fights for his life I am being reminded that Russians have a healthy dose of Viking blood in their veins. Germans are more subtle but way more methodical. They move in smaller packs marching purposefully along and sometimes even across the trails not paying much attention to non Teutonic hikers. When they find something interesting they monopolize it for as long as they want exchanging loud comments. They are incredibly well provisioned and after locating a suitable picnic place they proceed to extract and consume scary amount of sandwiches. If you happen to desire a snapshot of the geological formation without eating Germans sitting all over it you better have faith in your Photoshop skills. French are sophisticated. They speak la langue about issues of life and death such as food and clothes. They completely ignore my hellos until I finally start bonjouring them. Then, somewhat surprised, they respond; perhaps even smile. I do not see that since when I meet the French the Sun is always behind them. Even Canadians - yes Canadians: those happy, innocent, polite and friendly people are somehow transformed when touring US. At the Delicate Arch where a self imposed rule allows everyone 15 seconds alone to get a clean shot they decide to take of their pants. I am not a prude. And even if I was my eyesight is not what it used to be so I cannot be really offended. But Canadians mooning people is just sad. So what’s really going on here? Does the world attempt to take a sweet revenge on a helpless America? Does vacation turn perfectly fine people into a bunch of unthoughtful tourists. No wonder that the Homeland Security requires a photo and insists on finger-printing those savage hordes. My favorite theory used to be that everybody feels a bit safer and a bit more out there when they are in a country in which their language is not commonly understood. I’ve been known to remark mercilessly on people’s appearance in public places. But my remarks are whispered in Polish, not yelled at the unsuspecting natives. At least this is what I thought until now. This theory does not begin to cover pantless and decidedly English speaking Canadians. So may be it’s America. People feel more restless and unrestrained here. Good manners are left on the border. Americans celebrate mourn the end of summer a.k.a. the Labor Day weekend by driving away to vacation destinations. Like Breckenridge, Colorado. With all the energy spent on securing a lodging in an attractive place they neglect to devise an interesting activity to fill 3 days. They wander aimlessly down the street looking for any diversion. Eventually they fall back onto familiar pastime: shopping. Only they don’t buy much as the looming recession put an end to guiltless spending. After all those mountains, forests and deserts we are craving some urban experience. Sounds easy but it’s Utah. The only city of any respectable size is Salt Lake City. Formerly known as Great Salt Lake City. Well, let’s visit Mormons then. They don’t bite. At least as long as we don’t tell them about our atheistic inclinations. We arrive late afternoon and surprisingly we pay less for a downtown hotel than we’d spent on some two-bit chain motels. Parking garage costs $5. Yes, five dollars for 24 hours! I overhear a guest complaining there is a charge at all. Clearly he’s never been to Boston.